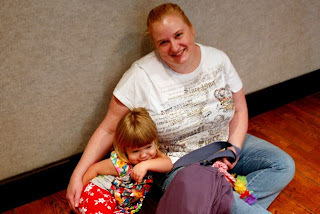 Yesterday I posted this picture of my sister and my daughter for Wordless Wednesday. Those two are thick as thieves. Lydia's middle name is Jane -- and yes, she absolutely was named after my sister. My sweet sister, who I can always count on to help me, to make me laugh, to be my friend. My sister and I may be 11 years apart in age, but that has never stopped us from being close. In addition to being a great sister, she's a fantastic aunt. My kids adore her, and my daughter especially will ignore all others in favor of being held, carried, sitting next to her aunt. Even I'm 2nd fiddle when Aunt Bunny is around. She's the Queen of Distraction, and is able to distract temper tantrums and meltdowns with amazing finesse. Lydia is always looking for the monkeys lurking around in the grocery store, thanks to her aunt. I still remember the day she was born, and how excited I was to be a big sister. She's my friend, and my sister, and I wouldn't have it any other way! Did you play Wordless Wednesday yesterday? Don't forget to play Tell Me Thursday today and tell your story! That's so good that you are close to your sister and your family love being with her as well. Great pic and story. Your whole family is a nice family I think!